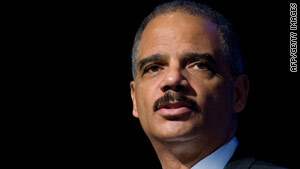 Attorney General Eric Holder says the Justice Department may sue Arizona over its new immigration law. Washington (CNN) -- Attorney General Eric Holder said Sunday that the Justice Department was considering a federal lawsuit against Arizona's new immigration law. "We are considering all of our options. One possibility is filing a lawsuit," Holder told NBC's "Meet the Press." Possible grounds for the lawsuit would be whether the Arizona law could lead to civil rights violations, he said. In Arizona, the city councils of Tucson and Flagstaff have decided to challenge the new immigration law in court. Holder told ABC's "This Week" program that one concern about the Arizona law is that "you'll end up in a situation where people are racially profiled, and that could lead to a wedge drawn between certain communities and law enforcement, which leads to the problem of people in those communities not willing to interact with people in law enforcement, not willing to share information, not willing to be witnesses where law enforcement needs them." "I think we could potentially get on a slippery slope where people will be picked on because of how they look as opposed to what they have done, and that is, I think, something that we have to try to avoid at all costs," Holder added. Holder said comprehensive federal immigration reform is the best approach for the problem of illegal immigrants crossing U.S. borders. His stance echoed the approach favored by President Obama, who last week criticized the Arizona law and said he wants Congress to work on the issue this year. Comprehensive immigration reform would include continuing government efforts to secure borders from illegal immigrants, as well as steps to crack down on businesses that employ them, Obama said at a Cinco de Mayo celebration at the White House. In addition, he said, those living illegally in the United States would have to pay a penalty and any taxes they owe, learn English and "make themselves right with the law" before starting the process of gaining U.S. citizenship.